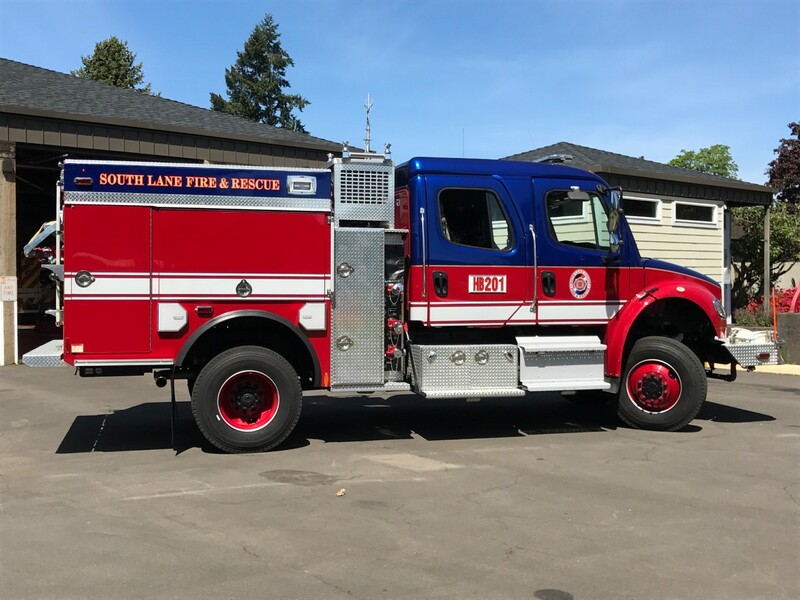 South Lane County Fire & Rescue Civil Service Commission will be holding a public meeting on Tuesday June 13, 2017 at 9:00 a.m.
Station 201 is located at 233 E. Harrison Avenue Cottage Grove, OR 97424. South Lane County Fire and Rescue will be holding a Work Session on Thursday June 15, 2017 at 6:30pm. There will be a Budget Hearing at 7:00pm with a Board meeting following directly after. This meeting will be held at the Cottage Grove Fire Station located at 233 E. Harrison Ave Cottage Grove OR 97424. Topics discussed will include: Creswell Fire Station, Committee Budget Hearing, Adoption of Budget. For detailed information regarding the budget and budget hearing please click here. Our new Heavy Brush engine has now been placed in service! This is the first of 5 apparatus funded by the 2015 Fire Equipment Bond. We are awaiting the completion and delivery of 2 engines, 1 aerial and 1 water tender. As your Fire Chief, I have been made aware some insurance providers did not change to the new ISO PPC rating for the District and continue to rate properties based on the old ISO PPC Rating of 5/9, which expired March 31, 2016. Effective April 1, 2016 the District’s new ISO PPC Rating of 2/4/10W became effective and is what each of your home and business policies should be rated on, if you are covered by a company using ISO. There are insurance companies that do not use the ISO Rating. The District invested considerable time, effort, and tax dollars, with your support, to achieve the new ISO PPC Rating of 2/4/10W on April 1, 2016. This was made possible partially by the 2012 Operations and Staffing Levy and the 2015 General Obligation Bond. The 2012 Operations and Staffing Levy provides the needed 24/7 Career Firefighter/Paramedics, while the 2015 General Obligation Bond provided the new fleet. We at SLCFR want to see all of our patrons get full value for what we have achieved together. We encourage everyone to go to the following link on our webpage and download the ISO letters and present them to your insurance carrier. If you find your carrier does not utilize or recognize ISO, we encourage you to exercise the freedom to shop the market. I have heard many accounts where folks have called their carrier, presented the information, and received a lower rate or refund. While I cannot provide advice or endorse a particular product or company, I can encourage you to take advantage of the free markets and your right to choose. There will be an Executive Session following directly after the Special Board Meeting Pursuant to ORS 192.660(2)(f) Discussion of a confidential attorney-client privileged document.